It took me *this long* to wander in to Animal, despite its convenient mid-city location - and once I got there, I can't believe how much time I'd lost without experiencing the fabulousness of this place. Home of talented chefs who put out the cookbook "Two Dudes, One Pan Maximum flavor from a Minimalist Kitchen", Animal's food/ vibe is captured succinctly by the book title. Three years from opening, there are still lines out the door on any given Saturday night. "Foodie Mentor" and I originally planned to slide in to the bar, right at opening - but several minutes lost to traffic resulted in other groups just slipping by us to fill the limited slots. Luckily, thanks to a no-show and an amazingly hospitable hostess (imagine that! 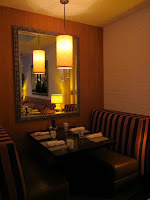 ), we actually ended up with a two top in the dimly lit, yet very casual dining room! Even before getting seated, we were drooling ravenously over the single page menu, simple in design but rich in diverse flavors. The menu changes daily, and I'm not sure if we just lucked out all the way, or if the Two Dudes are this consistently incredible - but every single dish listed lit our eyes on fire. That the bottom of the menu warns: "changes and modifications politely declined" makes me fall in love with the place even more. The chefs obviously put a lot of thought into their menu and it makes a lot of sense that they would want the dishes to be experienced as they were intended! 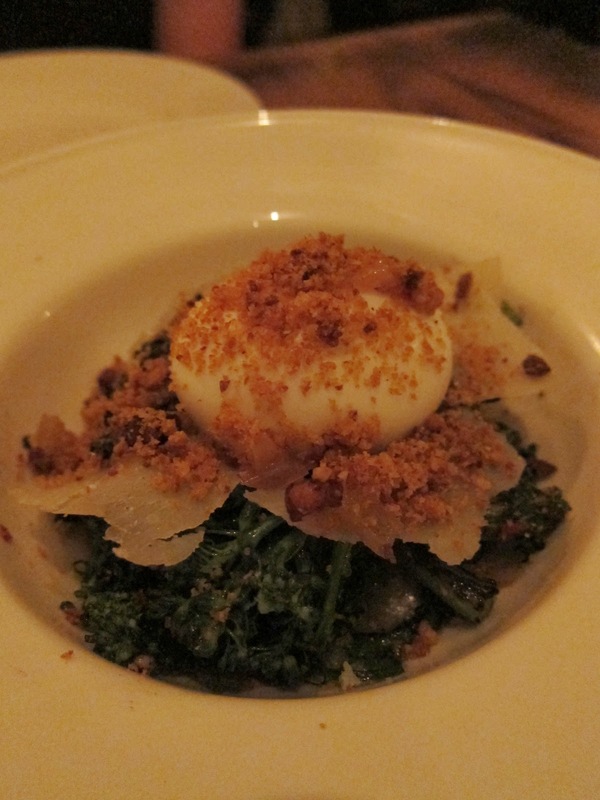 Realizing eventually that our wallets and stomachs cannot physically handle every item on the menu - we finally made our choices begrudgingly, and decided to start off with the grilled baby broccoli, soft egg, pancetta vinaigrette, parmesan ($13). This was simply amazing, and though I normally do not crave or get inspired by vegetables - this dish turned out to be one of my favorite veggie focused dishes of all time. Though of course, true to theme, this was definitely not designed for vegetarians. The baby broccoli was perfectly grilled, with just the right amount of crunch - and infused with such rich pancetta flavor, punctuated by vinegar and oil, that it sent us into an immediate feeding frenzy. Temper that with shavings of nutty parmesan, and top off the heap with a beautifully poached, deliciously runny egg and you have perfection in a bowl. We devoured this dish within seconds, like bears who had just come out of hibernation - leaving not so much as the carcass of its prey. I never thought I would say this of any vegetable dish, but I could eat this every day for the rest of my life. Next up was a dish we were super excited about - where there is a menu item that we are not familiar with, that is the one we consider it our mandate to order. Foodie Mentor's sense of adventure, when it comes to food, is one of the things I love about her. 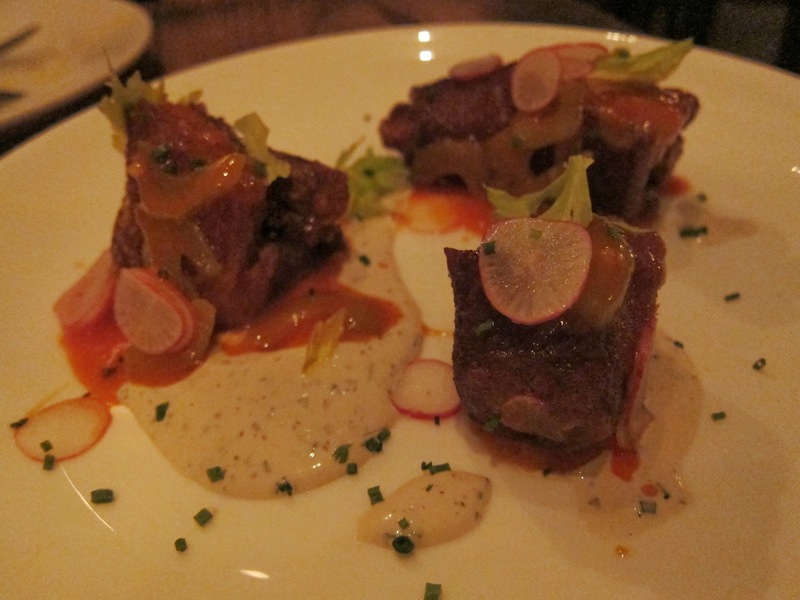 So when we saw pig tails, "buffalo style", celery, ranch ($11), we knew immediately that we had to try it. This seemed to really live up to the promise of the restaurant's name - it's all about the animal, in its holistic glory and celebrating every piece of it. We chose not to ask our server what the dish would involve, preferring to be surprised - all part of the fun of a meal in a place like Animal! I think in our minds, we expected an offal version of curly fries - cute little crunchy curlicues plucked from porcine behinds and plopped onto our plate. When the dish arrived, it was a bit of a surprise, the 'tails' were chunks of meat with a bone in the middle (I guess the upper cut of the tail) - lightly fried and flavored with a sauce that you would normally associate with buffalo wings. Overall, this was a tasty dish, but not as exotic as we had hoped - and reminded us more of buffalo wings made with short ribs. A poutine fan ever since my visit to The Gorbals - I had no objections when Foodie Mentor recommended the poutine, oxtail gravy, cheddar ($15). 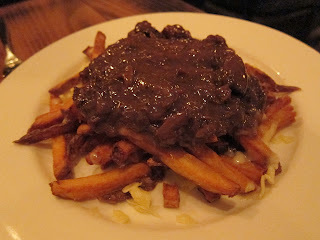 The oxtail was smooth, amazingly tender and flavorful, and provided a great contrast to the crispy fries underneath. Animal does not skimp, and the mound of oxtail makes this a very hearty dish, a potential meal in itself. Knowing what a foie fanatic I am, Foodie Mentor indulged me in the foie gras, biscuit, maple sausage gravy ($23). This was another amazing dish and tied for my favorite for the night with the baby broccoli. 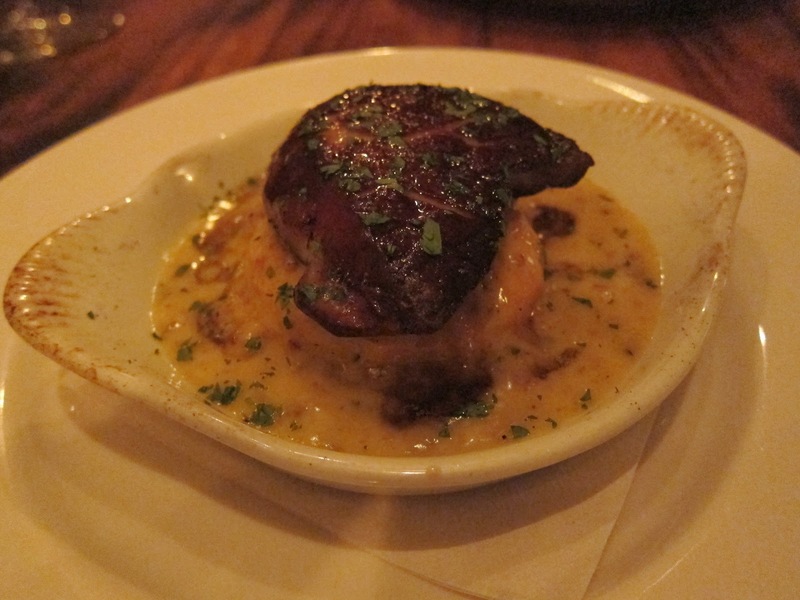 The foie was seared with skill, teasing out its earthiness and highlighting the creamy interior with a lightly crisped crust. The whole thing was served at a perfect temperature and enhanced by the buttery, flaky biscuit drenched in a rich blend of savory / sweet in the maple sausage gravy. 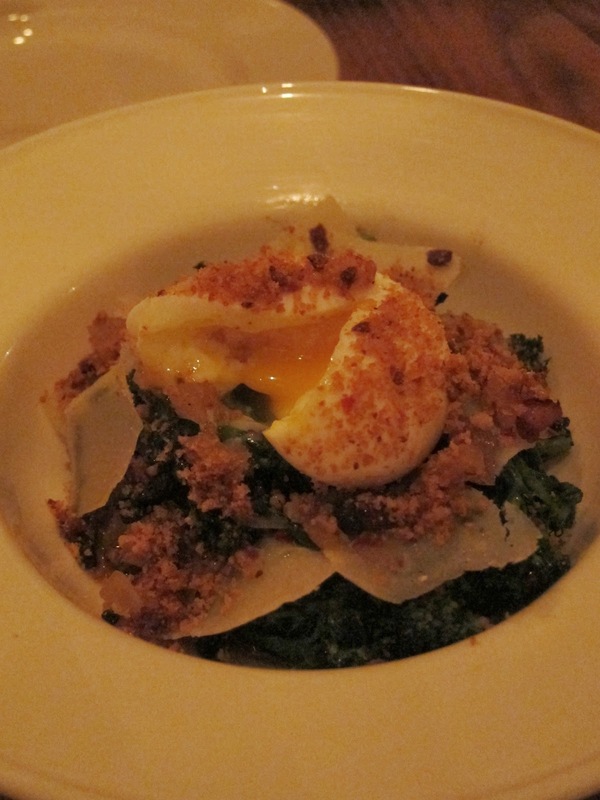 I could still taste this dish in my mind, weeks after the meal. 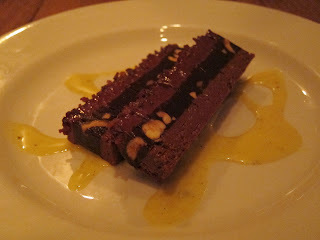 My other big vice is bacon - and true to form, even Animal's dessert list offered up an item for the unrelenting carnivore - bacon chocolate crunch bar, s&p anglaise ($7). I loved and inhaled this bar (barely retaining enough decorum to allow Foodie Mentor to have her share) - it was a perfect balance of creamy chocolate with crunchy salty bacon bits that cut through the sweetness nicely, and what tasted like toffee crumbs. The warm, lightly sweet syrupy sauce added just the right amount of extra sweetness to the bar. All in all, I found that Animal offers an exciting spread that makes rational human beings lose any sense of restraint - I for one fell prey to pure primal instinct to feed from the moment I set eyes on the menu. There were so many things still left on the menu that I wanted to try, including veal brains and sweetbreads, and rabbit legs - no telling whether the same preparations would be on the menu again on my next visit - but one thing I know I can count on, is that we definitely would not be bored. I also loved that you can experience the menu that dares to be different, without the snootiness of some fine-dining venues. You get the sense that the chefs' disclaimer about declining substitutions is more about sharing their visions of what their dishes are meant to be, served true to the way they were conceived, than about any sort of elitist attitude. I definitely plan to be back soon. And all this over vertebrates...as someone who is normally much more excited by creatures of the sea - this definitely propels the Dudes' most recent venture, Son of a Gun (seafood focused restaurant that just opened shop yesterday) - to the top of my list of places to bolt to next. Another dark, cold and stormy night in Los Angeles - time to catch up on blog posts (and dream of luscious meals on warmer days)! For my birthday recently, "Lindyhopper" and "Bicycletta" - my bestest friends ever for among other things brushing aside their own aversion to 'gourmet' - indulged me in a choice between Cleo or Fig. We originally decided on Cleo, but since we couldn't get reservations last minute, ended up at the fanta-bulous (but a bit further away) Fairmont Hotel in Santa Monica. I had been dying to go for a long time - but held off due to the relatively high prices for casual-sounding fare. I knew that many foodies whose opinion I respected love the place though - so I was ecstatic when Lindyhopper and Bicycletta said they would bring me!! 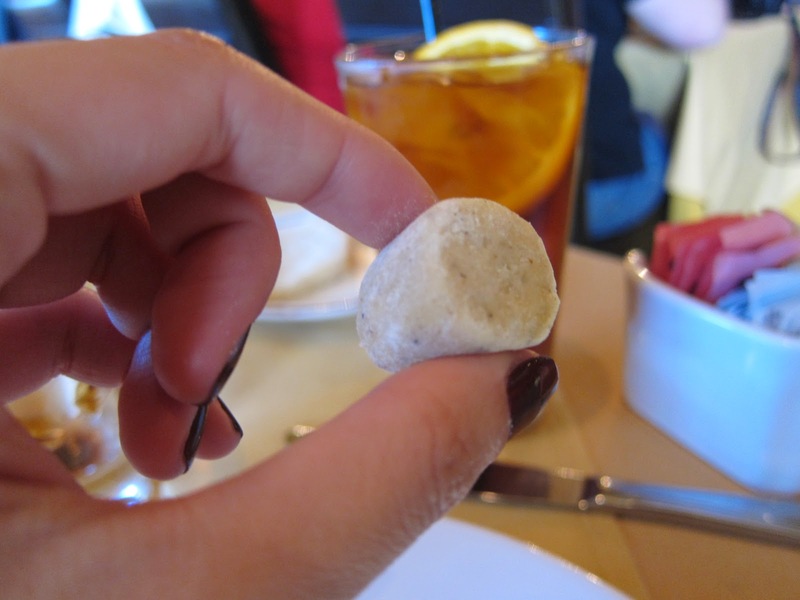 The Fairmont Miramar is an unexpected treat rooted just a block or so from the Pacific ocean. Though not quite beachfront, it is a lush, lovely retreat that you would never expect to find just steps away from the sea of humanity ebbing and flowing up and down Third Street Promenade. 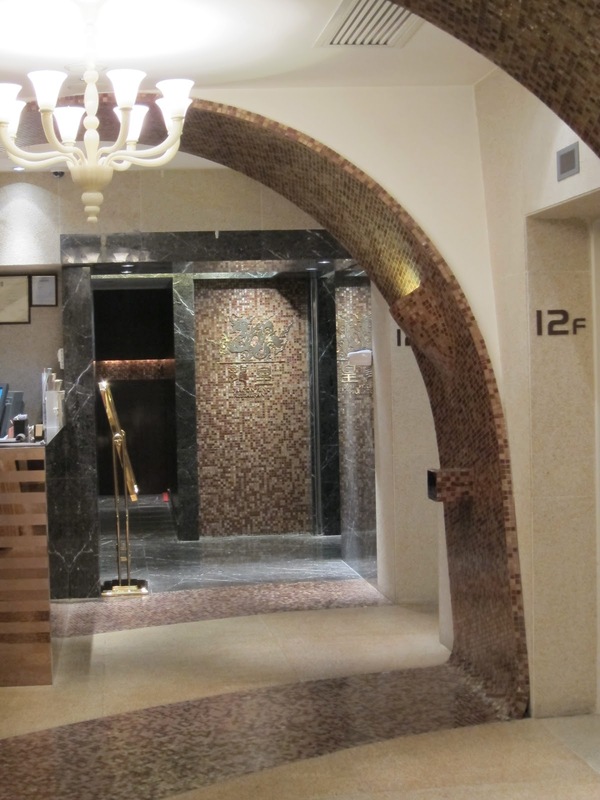 Just off of Wilshire and Ocean, the hotel's main entrance is grand, and breathtaking - with its wrought iron gates, long cobblestoned driveway and dramatic over-century-old Moreton Bay Fig tree (from which the restaurant draws its name) serving as centerpiece. A big part of a great dining experience for me is in the ambience, and both the hotel and its bistro are perfect in that arena. There are private bungalows set in the garden, with lovely waves of light from the pool / fountain washing gently over their walls at night. Just past the lobby lounge, you arrive at Fig, a relaxed, casual yet well designed space - with a long communal bar-height table and cute single booth in the front room by the bar, and pool side / patio seating in the back. It feels unpretentious, authentic - a great reflection on their menu, which is seasonal with French influences, a strong emphasis on fresh ingredients (sourced locally from the world famous Santa Monica Farmers' Market, conveniently walking distance from the restaurant!) from Chef Ray Garcia, and uncomplicated preparation. From the very first thing to arrive at our table, Fig achieves a great balance of fine foods served casual style. Instead of regular ole butter, Fig serves arugula butter, with salt to be applied yourself via an adorable wooden bucket / scooper set - delicious with their fresh baked baguette, served in a branded paper bag. There is a cheese and charcuterie bar, but I wasn't about to abuse the goodwill of my hostesses! 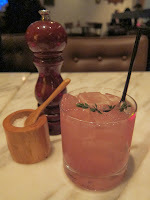 I did however feel compelled to order off Fig's cocktail list, which is just as mouthwatering as their menu - always seeking discoveries, I decided to go with the Rosemary & Rhubarb cocktail, which was light and refreshing and reinforced my recent preference for savory ingredients in my drinks. 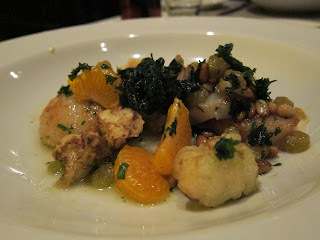 For our mains, I was torn between two seafood choices - luckily, Lindyhopper wanted the Hand-Harvested Scallops with Cauliflower, Pinenuts, Golden Raisins, Tangerines ($28) too, so I got to taste hers AND order the other dish I wanted. The scallops were probably the freshest cooked scallops I have ever tasted in LA - incredibly tender and sweet. The other ingredients were a bit extraneous and I thought should have taken more of a backseat, to let the scallops shine on their own. But still a great dish, though very spendy at $28 with barely 3-4 scallops on the plate. 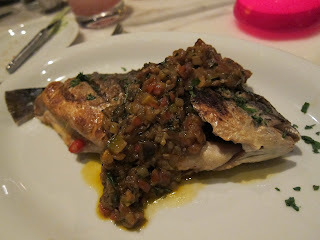 I was so happy to see my Whole Grilled Dorade ($28) served on the plate...whole. Not many western venues serve fish with head-on - and its not even that I eat any part of the head - but the sight of the entire fish just triggers whatever it is in my mind that thinks...this just got pulled out of the ocean. It wasn't hacked to bits and shipped in a freezer on the back of some truck for hours before arriving on my plate. 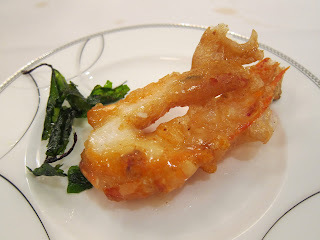 And one taste confirmed it - the texture was unlike any other grilled fish I've had - the meat was amazingly soft, smooth and subtly sweet - so much so that if not for the deliciously salty, crispy skin enrobing the fish, I would have thought it was steamed Cantonese style. The fish was topped by a tapenade which gave it additional flavors and nice texture contrast (though visually may not be the most attractive...). As if this were not enough to send my taste buds soaring, imagine my surprise to find in the middle of the fish, as 'stuffing' - fresh basil, slices of lemon, roasted peppers and sprigs of thyme! These ingredients infused the inside of the fish with incredibly rich flavor. This might be my favorite grilled fish dish to date (and I don't normally like grilled fish, as I feel grilling takes away from the pure, fresh taste of the fish)! Bicycletta was on a health kick and went with a Chopped Salad - which she loved. But I don't normally like raw vegetables so I didn't taste or photograph it. But I did capture all three of our desserts! 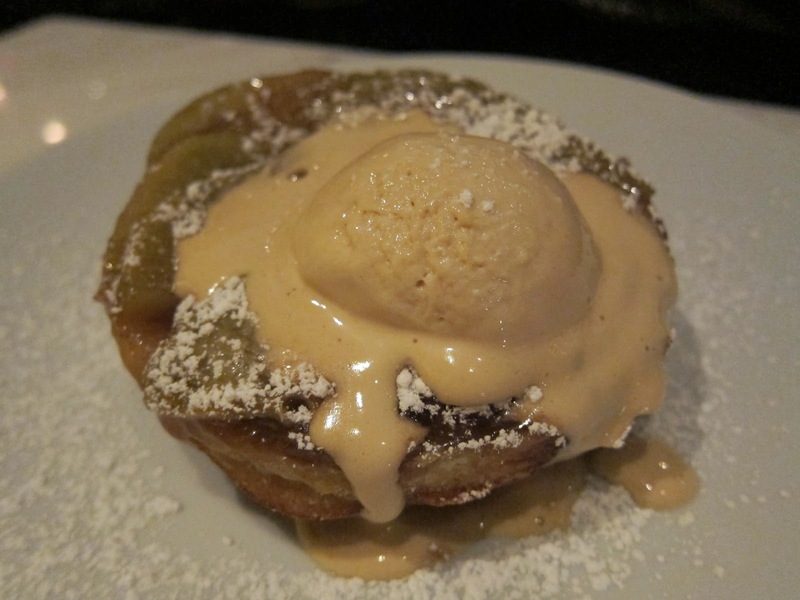 Of the three we ordered, I actually liked Bicycletta's the best: Melrose Apple Tatin with Caramel and Sea Salt Ice Cream ($9). The pastry base was served at just the right temperature - somewhere between warm and scorching hot - and was incredibly buttery and flaky. The whole thing was topped with powdered sugar, then crowned by a scoop of caramel and sea salt ice cream that showed the chef's skill in restraint with sweetness. As for me, there are a few things that have a Pavlovian effect on me that is beyond control (e.g. black winter truffle, foie gras, bacon, Parisian macarons, champagne truffles...) and Nutella is one of them. So when I saw the Nutella and Chocolate Tart with Candied Hazelnuts, Marshmallow Cream ($9) on the menu, I went for it like a puppy going off leash on the beach for the first time. Our friendly server brought the plate out with a candle on it - sweet! 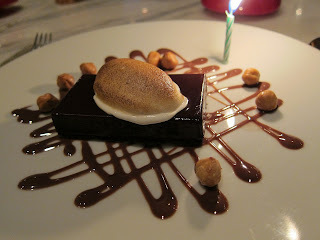 - and I loved the presentation immediately (especially the round of torched Marshmallow Cream). Unfortunately, the tart itself was way too dense and rich, which made the beautiful toasted marshmallow an overwhelming addition. The candied hazelnuts were a nice touch, adding light crunch to counterbalance the density of the tart. Lindyhopper, a fellow chocoholic, ordered the Chocolate Pot au Creme with Market Berries, Sable Cookies ($9). This was rich and creamy, and delicious with the fresh berries. Anyways, thanks again Lindyhopper, Bicycletta - and Fig - for an unforgettable meal - love you guys!!!!! 1MB Savvy Saveurs - This Week's Deals & Sweepstakes! Foursquare Food & Drink Deals via LA Weekly Food blog - personally, I am not willing to give up privacy for badges etc. from Foursquare - but for those who are into it, there are real-world rewards from free drinks to appetizers from restaurants ranging from Akasha to Pizzeria Mozza. See LA Weekly Food blog for details. groOrganic - up to 41% off eat green by cultivating your own organic garden, and do it with the aid of technology - save on planting tools and/or software to help you learn / track your garden! Via Gilt City Los Angeles. Hurry, ends 2/25 1pm PT! 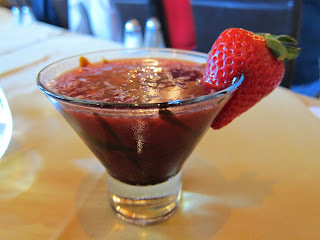 Old Pasadena Happy Hour Week - special menus and deals all week on drinks and small bites from $1 martinis, $2 beers to $3 gourmet sushi and appetizers. See website for details. iDine Monday Bites Contest Weekly contest - tell iDine how your Monday chomped down on you for chance to win a meal for your to heal in the form of a $50 American Express Rewards Card (no end date specified). Enter once a week on Facebook. One of the greatest tragedies of western experience of Chinese cuisine, at least in my view in the U.S., is that in general the average diner immediately thinks of a limited and pedestrian variety of noodles (chow mein, chow fun), the ubiquitous fried rice, orange chicken - and for the slightly more experienced, dim sum in chaotic sensory-overload chambers in Chinatown. 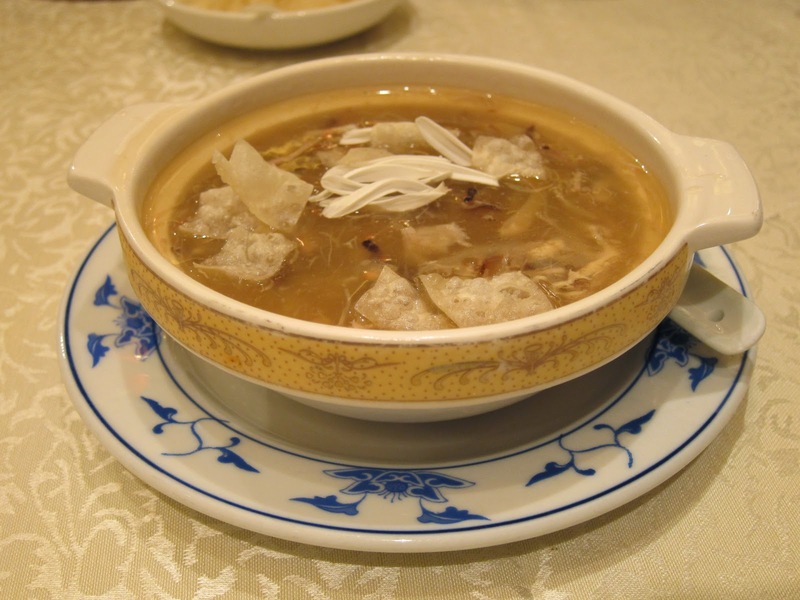 If only everyone can experience the variety, creativity and traditional yet ever-evolving flavors of regional Chinese cuisine, from the highest end temples of marbled magnificence to the lowliest hole-in-the-wall - like that which is on offer in abundance in Hong Kong! I've enjoyed Chinese food all my life, and still find myself discovering / learning something new every meal. 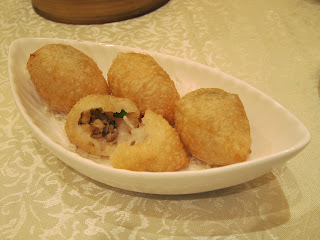 I've covered a few of the good eats on my most recent trip in various posts, but one of my absolute favorites this time around was at Fung Shing Restaurant - mainstay of Shunde cuisine since 1954 when the late Mr. Fung opened his first restaurant in the group. First off, I should say that Shunde cuisine is not 'haute cuisine' - it's hometown style comfort food steeped in tradition. 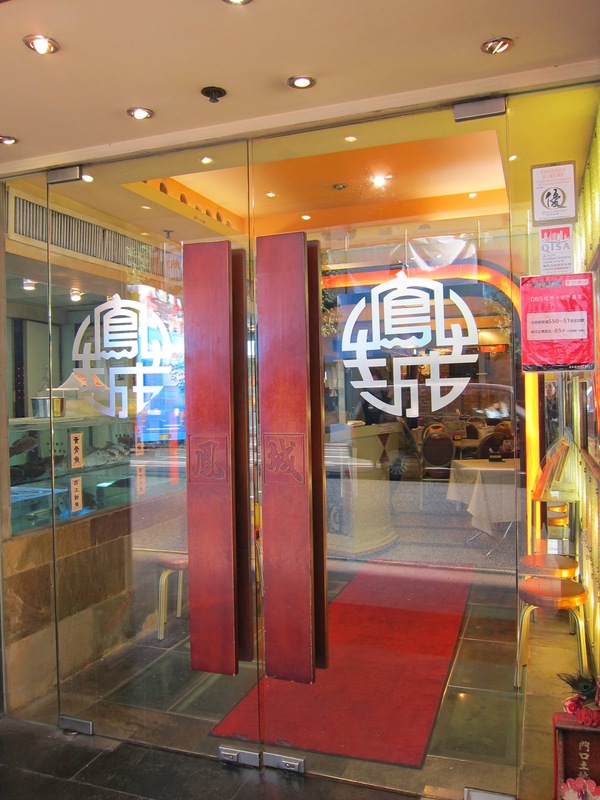 The particular location of Fung Shing Restaurant 凰城酒家 (translates to Phoenix City) that we visited in Causeway Bay is almost a hole-in-the-wall - no chandeliers, no frills compared to the glossy 5-star hotel or shopping center based eateries. 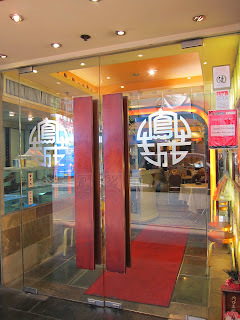 (Several of the other 6 locations in the group are higher end and serve as banquet halls) But sometimes simple is best - and the flavors of the dishes at this purveyor of authentic Shunde cuisine definitely had me hooked from the first bite / sip, and I still dream of some of the dishes! 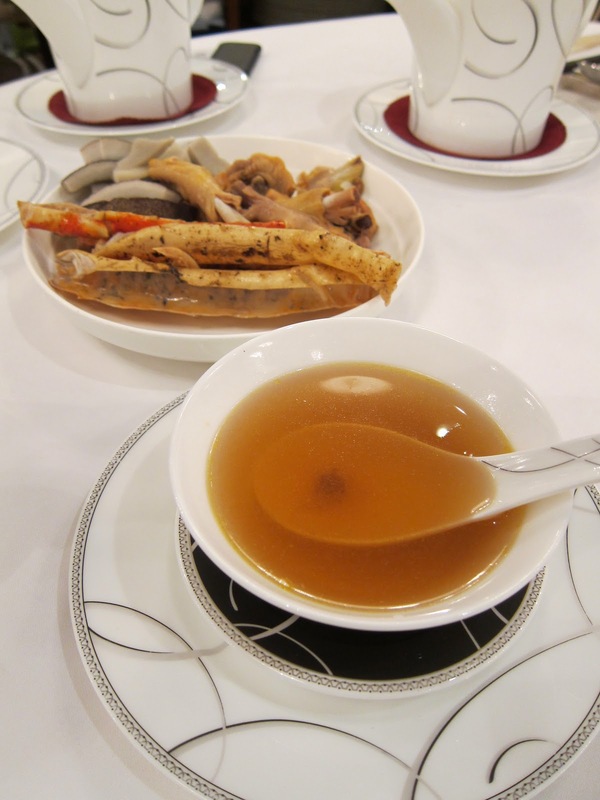 As it was a relatively cold winter day - at least as cold as it can get that close to the equator - we started our lunch with Snake Soup 菊花五蛇羹, a winter favorite as it is believed to help raise body temperatures (because it's harder to digest than regular proteins?). The snake is chopped into very narrow strips - if no one told you what you were eating, you would never be able to tell, and might mistake them for slivers of mushrooms (though the texture is firmer with more crunch). 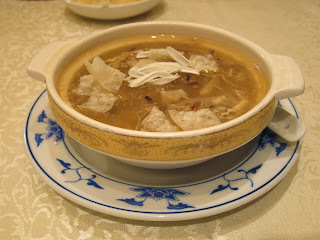 The soup is served with chrysanthemum petals and crispy fried flakes of dough for texture contrast. 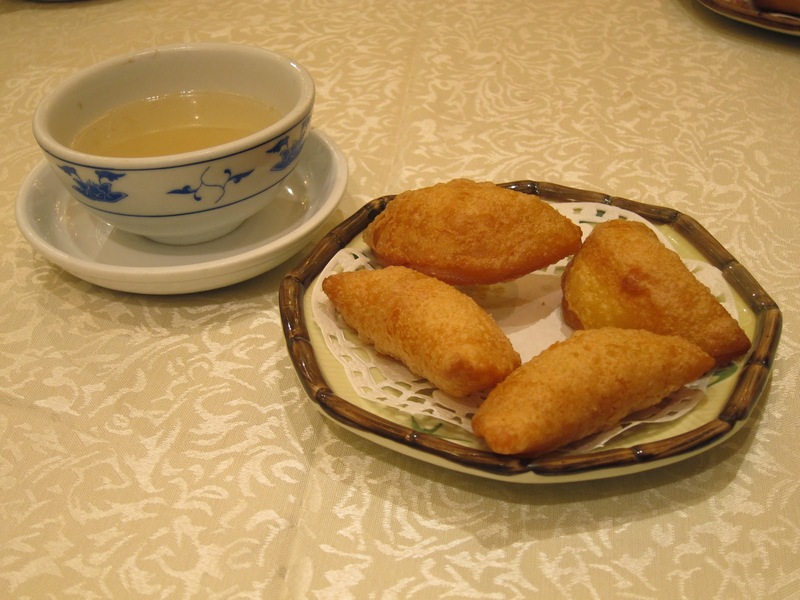 After warming up with soup, our dim sum dishes started arriving. 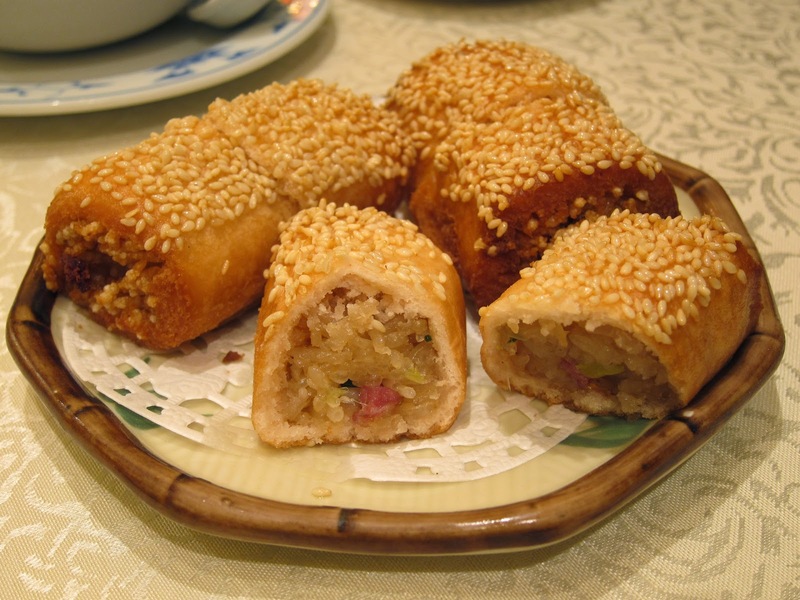 The Fried Glutinous Rice Rolls filled with 'South Cheese' 南乳糯米卷 were my favorite - if I were a millionaire I would fly back every weekend to eat this. Perfectly cooked sticky rice is mixed with 'South Cheese' (direct translation, not sure what the official English name is - a Shunde specialty of salty and slightly sour fermented bean curd made of soybeans, salt, rice wine and sesame oil or vinegar, pressed into blocks, soaked in brine and flavorings and sold in jars as condiments), then rolled in the most buttery, flakey crust and sesame seeds, then the whole thing is fried. Amazing!!! Another Shunde specialty that we didn't get to this time is Milk Solids 大良牛乳 served in Congee (rice porridge) - this is what parents usually serve kids when they get sick, as it provides easily digestible protein. I was saving room for all the other delicious dim sum dishes - and I don't remember liking the flakes of milk solids - but for those who do - Fung Shing sells them in bottles at the front of the restaurant. Next were Fried Dumplings with Shrimp & Carrots, which you dip in broth. This was a delicious dish, but not as unforgettable as the Fried Glutinous Rice Rolls. We ordered a second fried dumpling dish simply because I'm addicted to foie gras, and this one was named Fried Dumpling with Goose Liver 鹅肝鹹水角. Unfortunately this 'fusion' dish didn't work so well - the pieces of foie were small and dry - I couldn't even tell if they were liver or just pieces of dried up pork. Sticking with traditional Chinese / Shunde for the rest of the meal, the next dim sum offering was much better - Shu Mai with Quail Egg & Pork Belly 鹌鹑蛋燒賣. 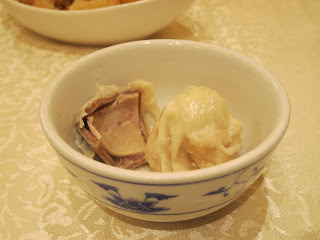 This was a reinterpretation of the traditional Shu Mai (cylindrical meat dumpling with pork and sometimes shrimp) - topped with a hard-boiled quail egg and a soft, fatty piece of pork belly as indicated in the name. Another incredible dish - so much so that I forgot to take a pic while it was still in the steamer, and had to borrow my mom's before she could fully dig into it. 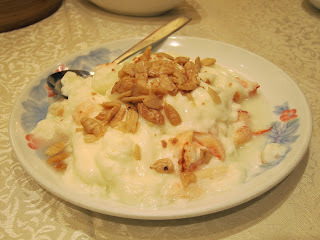 The grand finale was another best of meal dish - Stir Fried Fresh Milk with Egg Whites, Shrimp and Pine Nuts 大良炒鲜奶. I have always been fascinated by this dish growing up, as it was simply called "Stir Fried Fresh Milk" in Chinese, and I couldn't understand how you could possibly stir fry milk. Now I know that it's mixed with egg whites to give it the full bodied yet incredibly smooth texture. I don't know what seasonings they add to make simple milk and egg whites so flavorful, but it always tastes much more complex than you would expect from such simple ingredients. It's at once savory and very subtly sweet - with lovely pieces of fresh shrimp, and pine nuts lending additional flavor and crunch. I usually hate pine nuts as their shape and texture make me feel like I'm eating somebody's baby teeth - but for some reason the kind they use at Fung Shing is longer, flatter and softer - and I think they chop the nuts up a bit so that you don't get the nasty glossy enamel-like surface. We inhaled this dish - and it is definitely another one I would fly to HK for!!! 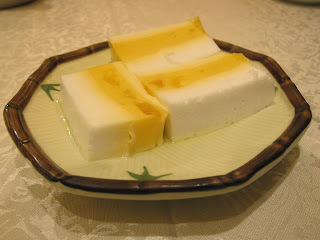 For dessert, we had Mango and Coconut Pudding Cake 芒果椰汁糕- served cold. Mango pudding (made into a gelatinous form) is a very typical dim sum dessert - but here they layered it with coconut and the tropical flavors work really well together to provide a refreshing sweet finish to the meal! and to top it all off, the best thing was that when the bill came, it was only HK$384 or roughly US$49 - the grand total including the 10% service charge typically built in to restaurant bills in Hong Kong - for a very filling meal for three people!!! This place is definitely going on my list of top places to go back to on my next trip. Note for tourists: Fung Shing is super traditional and authentic - which also means there is no English menu (at least at this location - names noted above are my own translations), so either bring a native speaker, show your server the pics/Chinese names in this post, ask your concierge to write down names of recommended dishes before your visit, or I guess point to dishes you like that you see on other people's tables! There's the old adage "When life gives you lemons, make lemonade". Living in Southern California, we are totally spoiled by / blessed with beautiful weather almost year-round - so when it's uncharacteristically cold and rainy (i.e. a "harsh winter day" - a shameless abuse of the phrase which induces groans and eye-rolls from my brother, a Montreal resident) like today - I consider it a 'lemon day'. With a half day off in anticipation of the three-day Presidents' Day weekend - and weather providing strong incentive to curl up and stay in, I realized I can take my 'lemon day' and squeeze some blog posts out of it! 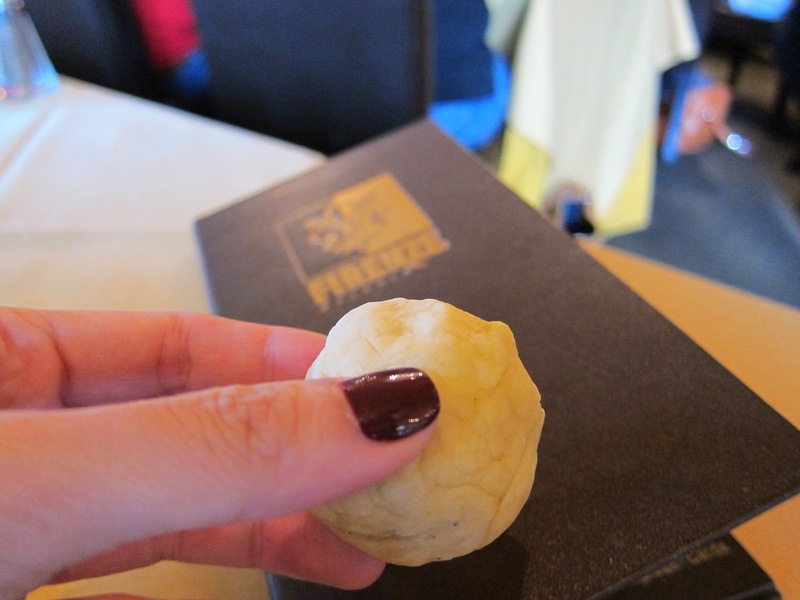 Time to catch up on some of my recaps of meals from my most recent trip to Hong Kong. After lunch at Prince Restaurant, my parents and I decided to head to a shopping center/office complex in Causeway Bay called wtc more to walk off all that we had ingested earlier in the day, before dinner at Dragon King Restaurant. The wtc more shopping center is notable for its massive Muji and Uniqlo stores, purveyors of Japanese, decent quality-low priced, deliberately non-branded fashions (plus home/office goods/snacks from Muji) for the masses. This time around, I caught the end of the Uniqlo post holiday sale, and scored 2 sweaters, 1 belt and 1 scarf for less than $50 US! Working up an appetite from strolling through the 7? floors of shops, we made our way eventually to the stack of restaurants above the stores - the 12th Floor is taken up entirely by Dragon King Restaurant. We had been here on a previous trip for dim sum, and loved the space - with its amber / sand color scheme, chandeliers and fantastic harbour views. This time my mom told a fascinating tale of fame / fall and redemption that starred the chef of Dragon King - Mr. Wong Wing Chee or "Brother Chee". Apparently Brother Chee used to be a master chef at the top of his game at Hong Kong restaurant staple Lei Garden (now Michelin starred). He immigrated to Australia, somehow picked up a gambling habit, lost everything he had, was shamed with desperate pleas to friends and family for money - and ultimately very publicly fired from his job. Broke and hopeless, he decided to go home to Hong Kong. On the way back he vowed to quit gambling and work hard to put his real talents to work and to win back his spot at the top of the restaurant food chain. And he managed to pull himself up by his proverbial bootstraps - going from flat broke to now head of a prestigious, award winning restaurant chain, published author of numerous cookbooks, and a celebrated TV personality with his own cooking/travel shows! According to my mom, Brother Chee's rise to fame the second time around involved creative takes on traditional Chinese dishes, using unique ingredients or combinations to produce unique dishes. With all that context, I was intrigued to try Dragon King again. We started our meal, as most Chinese meals do, with soup. This was one I'd never seen though - Coco de Mer Stewed Coral Crab Soup (HK$178 for enough to serve 2 people ~US$23) - coconuts 'of the sea' (native to Seychelles) boiled with crab, dried scallops, and chicken feet. The broth was savory and sweet at the same time, yet clear and refreshing. In an adventurous mood, for one of our mains we ordered up Braised Crocodile Tail in Oyster Sauce (HK$128 per person - minimum 2 orders ~US$16). This wasn't the first time we've had croc meat - apparently when my brother and I were kids, our grandmother fed us soup made with crocodile meat to help 'treat' our asthma (old school home remedy - Mom thinks it may be the steroids in the meat that is believed to help with asthma). Crocodile meat, from memory, tastes like chicken but a lot tougher with a more fibrous texture - but we had no idea what to expect of crocodile tail. 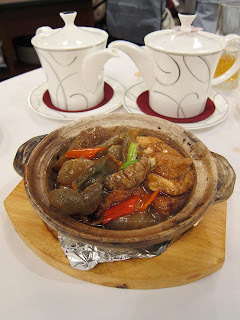 It arrived in a claypot stew - and at first we mistook it for sea cucumbers, another entree we had ordered. 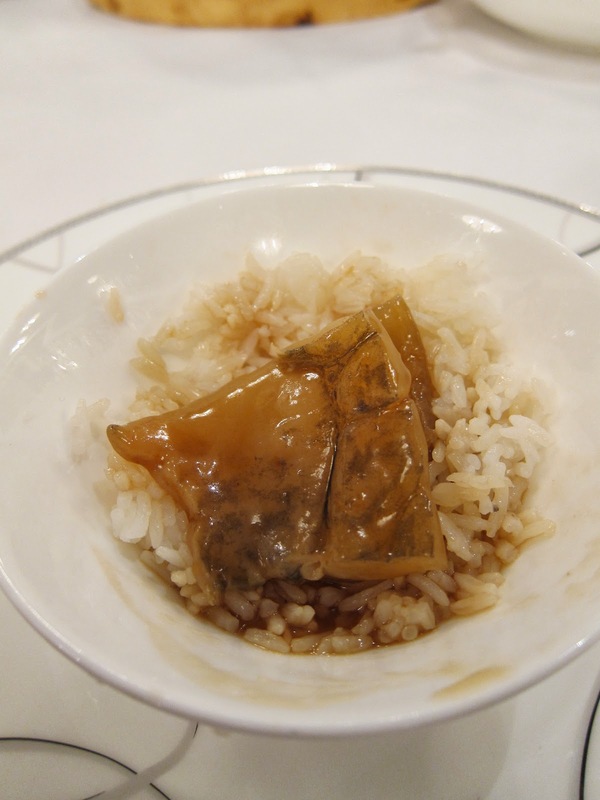 The tail was cut up into small pieces and tasted like thick bricks of congealed gelatin. Even with crunchy mushrooms for counterbalance and a rich flavored sauce base - I still thought the texture was overwhelming and not something that we would personally want to eat again. But Mom and I were still glad to have tried it - now we can have an informed opinion about this dish. Next was the 'real' Braised Golden Sea Cucumber with Drumstick Mushroom in Oyster Sauce (HK$148 per person ~US$19) - I like having sea cucumber once in a while for its unique texture, a combination of chewy/ gelatinous with a jellyfish-like crunch. And this dish was great and flavorful, but unfortunately since we had just had the crocodile tail, which was very similar in texture, this dish became a bit too much. This was my fault for lack of planning - should have pinned down our server to confirm what we were getting ourselves into with the crocodile tail first. But on another day with more balanced meal planning, this claypot stew would have been fantastic. Aside from the main menu, there was a special list of fresh seafood that Dragon King flies in direct from their own ships in Sabah! Having just come back from Sabah and loving all the amazingly fresh seafood there - we thought we'd give the Butter Salt Baked King Prawn (HK$128 each ~US$16) from this menu a try. The reason we got it, turned out to be exactly the reason we shouldn't have ordered up this dish - our expectations were way too high, and the prawns afterall did have to be flown in and of course could not possibly be as fresh as having them in Sabah a short time after they are pulled out of the ocean. The breading was also a bit soggy...too bad. Luckily the meal ended as well as it began. We finished off with what I call "The Departed Dessert" (misprinted as "Layered almond and pumpkin mousse" on menu, named "Mo Kan Tao" HK$29 ~US$4). This dessert is inspired by the original Hong Kong movie, "Infernal Affairs" ("Mo Kan Tao") which film buffs will know was remade by Scorsese in the US into "The Departed", starring Leonardo DiCaprio and Matt Damon. 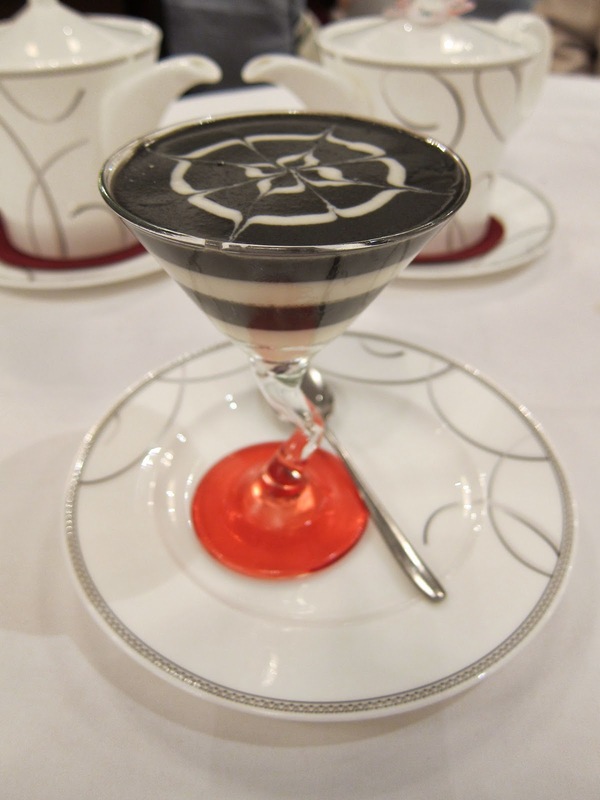 Inspired by the complex layers of identity of good/bad cops/crooks in the movie, this dessert has layers of black and white sesame / almond mousse topped off with a web of confusion on top. 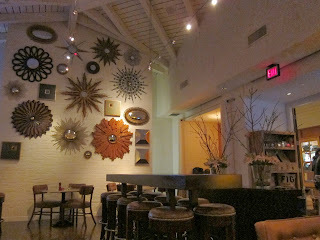 Love the modern movie inspiration in the traditional culinary arena - and the dessert tasted amazing! Though we did not have an incredible experience with this particular meal, memories of the great dim sum we'd had previously, along with the extensive menu still to be tasted, as well as the inspired starter and dessert, beckons us to come back for another try some other time (and next time I think I'll entrust the ordering to my mom). Though backstory aside, between the King and the Prince in terms of the meals themselves - I much preferred the Prince. 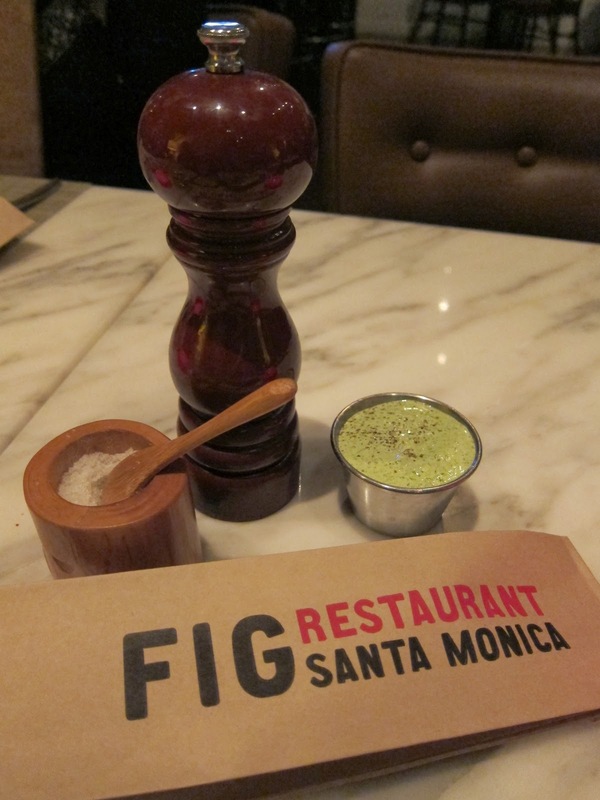 Fig Santa Monica - two offers! As anyone who's seen Fabio on Top Chef knows - the guy is fun, likable, and full of hilarious soundbites. He is not about haute cuisine, and very clearly states this - he learned to cook from his grandmother, who passed on 400 year old recipes, and is passionate about simple, traditional Italian cuisine. So, making elaborate works of edible art is clearly not what this class is about (as Fabio says (I'm roughly transcribing from memory here) "...with all the molecular cuisine now...it's like, what do I do with this? I don't want to sniff a line of steak flavored powder, I want to enjoy my steak with knife and fork...and these people are amazing, they are geniuses, but most of the time you leave these places, with the amazing food for six hundred dollars, you are still hungry and you go to the local pizza place afterwards"). This class was for people who just want to learn, in a few hours, to make a nice plate of pasta at home without having to go through CIA (Culinary Institute of America) training. So the two-hour class is in Firenze Osteria's main dining room (with tables rearranged to seminar style aisles), with Fabio doing his demo from the open kitchen. The class comes with a 2-course lunch and standard beverages like iced tea. However, drinks from the regular bar menu are still available - you just have to pay for it separately. And of course Miss Sassy and I could not be in Firenze Osteria and not have a Balsamic Martini ($9.50) made with muddled strawberries, fresh limes, vanilla rum and balsamic vinaigrette. With drinks at the ready to kick off the class, we dove in to learn how to make fettuccini and gnocchi from scratch. 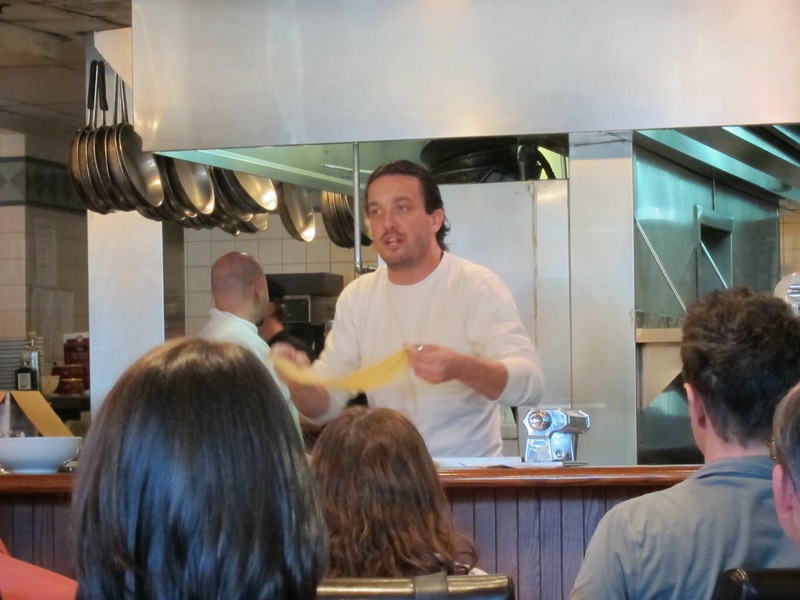 Fabio's approach to the class is casual and entertaining - he makes it clear that this is a class for anyone who wants to make great fresh pasta at home, not for aspiring professional chefs. Accordingly, he's got his food processor, Kitchen Aid mixer, and manual pasta roller out on the counter - mimicking what the average person would have access to at home. He breaks down the process for making fresh fettuccine to just a few simple ingredients, 4 cups flour, 4 eggs, 1 tblsp olive oil, pinch of salt, pepper - and a few steps - measure, put in mixer, roll through pasta machine (on biggest # setting, until sheet is thin enough to see your hand through), cut into strips! - so that anyone can do it. That Fabio learned to cook from his grandmother seems to have influenced his approach to recipes - it's not about precision, but intuition. You have to adjust how much olive oil you put in, for example, depending on how dry your dough is. This is the way my own grandmother passed on her recipes as well - there's never an exact measurement like I wanted - a 'splash' of this, a 'bit' of that, vs. an exact formula, 2 tsps, 1 1/4 tbsps etc. But for this class, Fabio estimated for the benefit of those who need the specific directions. I do get that being able to adjust to the ingredients in front of you and how they are coming together, maybe why our grandmother's dishes always turned out so well - they weren't stuck to a preconceived notion of how the dish should be done! So back to Fabio - he showed us how to be able to tell when your dough is at the right consistency ("basically when your food processor is about to jam and makes funny noises like it's going to explode all over the place...then you know it's time to take it [the dough] out"), and a really helpful step in the class - handing out sample balls of dough so we can see and feel for ourselves. 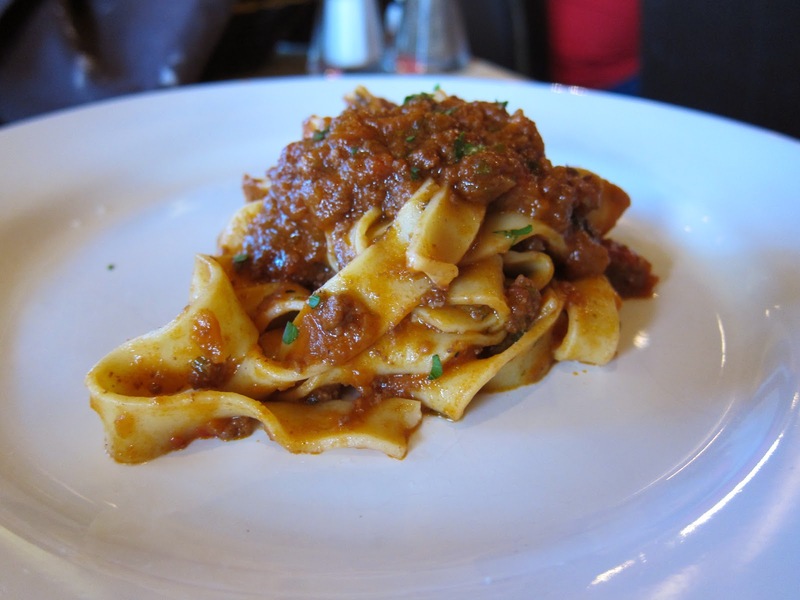 After demonstrating how to make the dough, roll it into sheets and finally cut it into strips of fettuccine, we got to taste it in the form of the first course of our lunch, Fettuccine Bolognese. So simple, but so fresh tasting and delicious! 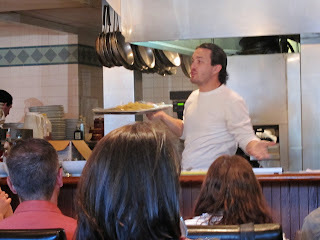 The second demo was for gnocchi, and Fabio again made it seem so simple that I am inspired to try it the next free weekend that I have (I'm usually too busy to cook, and the things I want to make require a million ingredients which discourages me so I end up eating out a lot! But Fabio made this seem so fast and easy that I'm tempted to try it...). Basically, you bake some potatoes skin-on at 350 degrees until soft, cool, scoop out and grind/ mill them to produce about 4 cups (don't mash, grind until they are a fine mealy texture), rest them overnight in the fridge uncovered, then blend in food processor with pinch of salt & pepper, and 6 tblspoons flour. Mix quickly, then add 1 egg at a time until mixture starts to look like dough - and add a pinch of nutmeg. Then take a handful and knead (dough should not be so sticky that it clings to your hand - if too sticky, add more flour) - this is to ensure moisture reaches all parts of the dough. Cut the ball into quarters, then roll into sausage shape - sprinkle some flour on top, roll then cut into small bite-sized pieces. 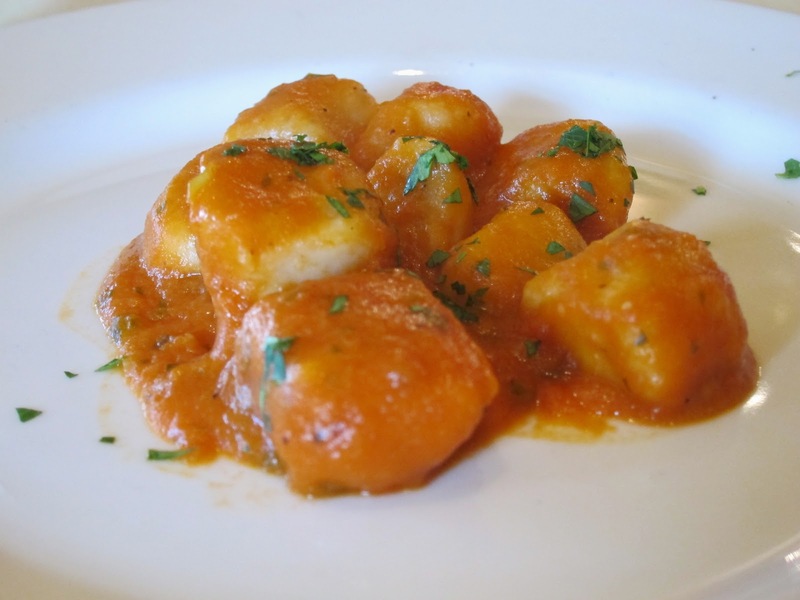 Put only 1-2 servings into boiling water, don't stir - until the first piece of gnocchi floats, stir quickly, then take all pieces out of the water when the 2nd one floats. And of course we got to taste the fresh gnocchi as our second course - again delicious, little pillows of fab-ulousness! My only note on the class would be that I wish it would include how to make at least one sauce as well - it's great to learn how to make pasta fresh, but that is only half the battle when making dinner. And arguably, that's where skill/technique/ insights are needed to create memorable flavors that dinner guests can buzz about. 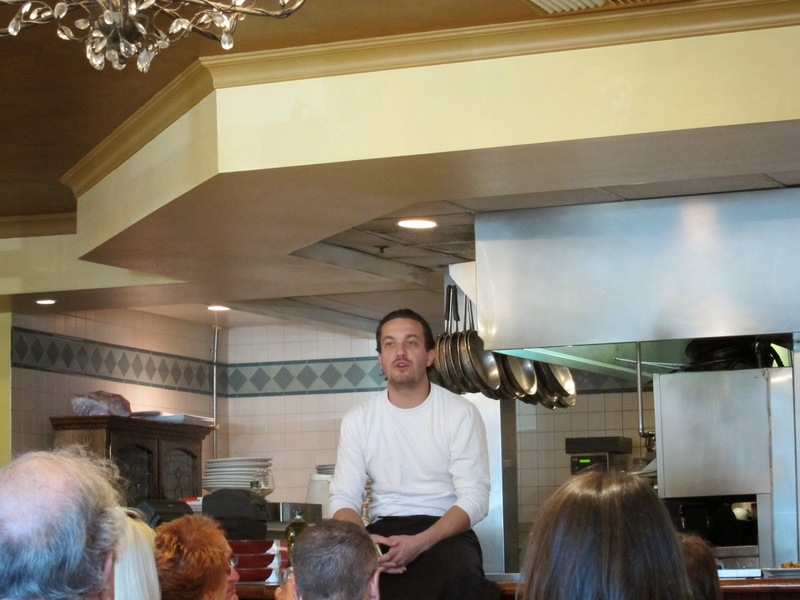 At the close of the class, Fabio hopped onto the counter to take questions, including of course those about behind the scenes of Top Chef! Who would he be friends with, Stefan or Blaise? Blaise to open a restaurant with, and Stefan to go to a birthday party with! Would he host another class soon? 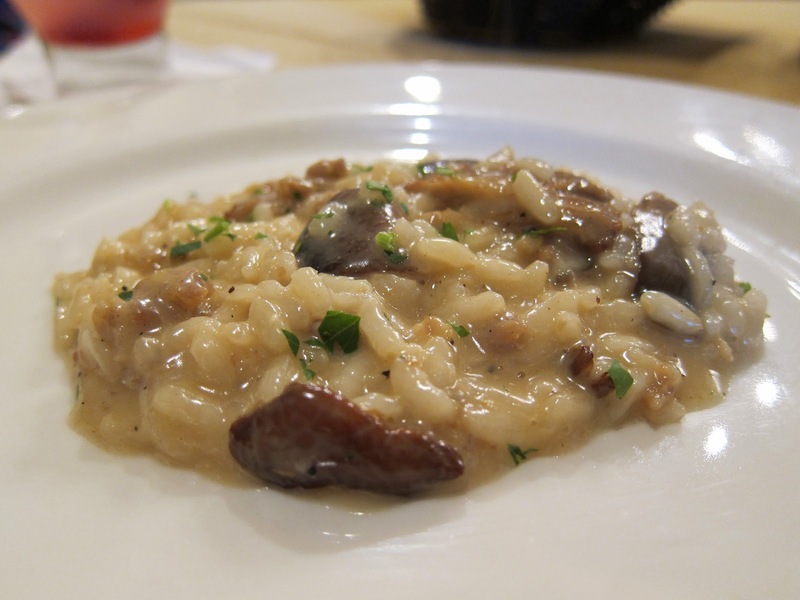 And just like that, on request, two more classes were added to the schedule - 2/20 and 3/20, to learn how to make four kinds of risotto. All in all, a fun afternoon activity in Studio City. Advanced chefs may not get out of this 'class' what absolutely beginners would, but again, it's a fun and engaging time, and your fee covers lunch. If you live in the Valley like I do - what else is on in the neighborhood, on the weekends (besides Studio City Farmer's Market)? Valet is 'only' $4.50, but there are also plenty of open meters on Lankershim (free on Sundays! ), and free street parking on Valley Spring Lane. "Lindyhopper" had wanted to attend the last class - but since it was already full, I signed Lindyhopper and myself up for the Risotto class at the end of the last one to ensure we could get in. 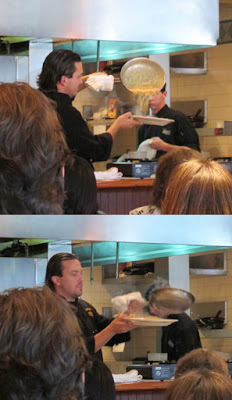 On another sunny Sunday, we headed to Firenze Osteria for the Risotto class to learn how to make Risotto three ways. 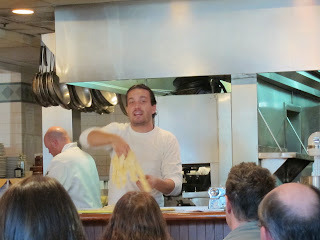 This class was as much fun as the last, with Fabio cracking lots of great one-liners, sharing moving personal stories about his childhood in Italy, and offering great pnemonics for specific steps in the risotto making process. Arborio is the best for everyday use, as it's hard to burn this type of grain. Fabio showed us how to cook risotto three ways, starting with "Basic" - noting that you never need to rinse the rice grains before cooking. Basic risotto is simply made with extra virgin olive oil, butter, handful of finely chopped onions, chicken stock and parmesan. With risotto, you always have to keep the rice hydrated during the cooking process. 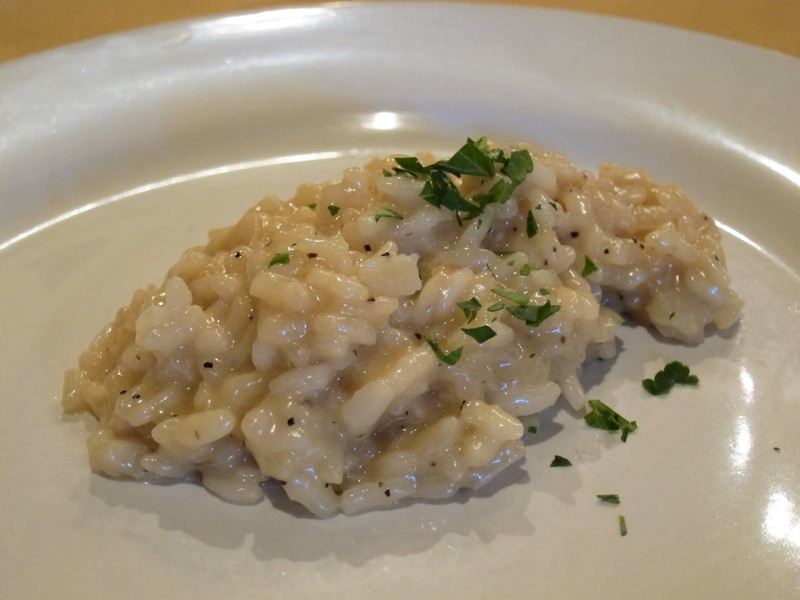 Risotto Fabio's way is 'never made with water' - always use soup stock - he uses chicken stock. A great pnemonic Fabio offered for how much broth to use is to think of where the ocean meets the beach - 'shoreline' level is really the amount of liquids you should have 'barely covering' the rice. We of course got to taste each type of risotto after learning how to make it! Risotto the second way is labelled "1 Pot Wonder" - again Fabio breaks it down so that it's very simple and easy for folks to do any of these dishes at home (considering one guest actually asked how to grate parmesan cheese...). The 1 Pot Wonder is slightly more complex than basic, involving mushrooms and sausage (broken out of casing). As with the last class, Fabio liked to engage his audience, and came around the aisles with his pan of risotto to show us how it should look at critical stages of cooking. 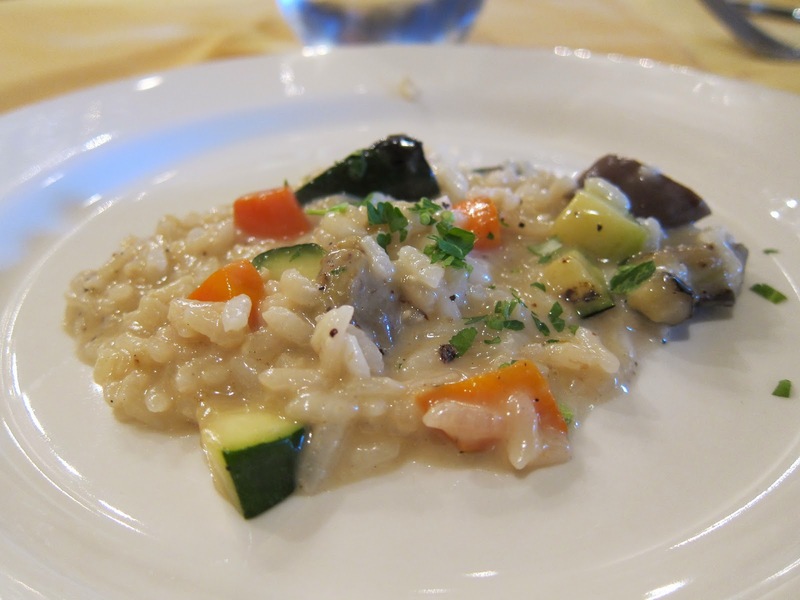 Risotto the third and last way is "2 Pot Wonder" - involving carrots, zucchini and eggplant. You use two pots for this one as the veggies need to be cooked separate from the rice in order to avoid overdoing the vegetables (so that they can retain structure and some crunch). Fabio had a team recording this session, which he said would be posted on his website soon! All in all, another fun Sunday afternoon activity, again another sold out class. And this time we got a three-course lunch of great, creamy risottos three ways for the same price as the two-course pasta class. It was great to hear that Fabio will be offering a sauce class next afterall, on March 27th, those interested should sign up soon before it fills up! Dining out on holidays is always a bit of a gamble - prices go up and quality doesn't always go in the same direction - but here are some options that sound interesting / enticing enough to check out. I'm including entertainment, and options for singles and couples - singles should get to celebrate (independence / license to just have fun) as much as couples celebrate commitment! Have a laugh at dating, mating and cohabitating - in the animal kingdom. Go 'wild' for Valentine's Day at the Los Angeles Zoo and Botanical Gardens with a provocative "birds and bees" presentation. Learn "about the pros and cons of relationships and staying single in the jungle with this light-hearted and informative lecture". Puts a whole new perspective on things. Evolutionary Psychology, anyone? Adults only event - ages 21+. Festivities include desserts and wines. Cost: $15 steam room access. Massages & skincare all $100 or less. Okay, so they don't have an official Vday event at this spa, but it's WOMEN ONLY and go bold and confident - swimsuits are not permitted (guys, eat your heart out). Book yourself for a day of pampering with massages or facials and blow off some steam in the steam room. Then grab your girlfriends and go to any of the fab Korean BBQ restaurants in Ktown to feast on meats that will ultimately be much better for you than the kind you'll meet at the bar on Vday. Casual fun? Snuggle with 150 other speed daters on a giant red leather sofa (213 feet in length!) and mingle with fellow speed daters to see if you hit it off - if not, you've only invested 3 minutes of your time each, yay for efficiency. Drinks and food served after event, as well as ice-skating at 'Ice at Santa Monica'. Join Renee Piane and Julie Ferman (Cupid's Coach & eLove) & Friends - "Get Connected" with 150-300 Professional Singles Ages 30's and up. Panel at 7pm, mixer at 8pm, dancing until 11pm. Cool space that was Downtown LA's first private power plant. Now a bar with design aesthetic described as "Industrial Cathedral". The Queen of Hearts Band will entertain you with Dancers, and DJ while you sip The Queen's Punch made from Perrier Jouet Champagne, Beefeaters Gin, Strawberry and a Secret Potion. Romantic poolside dining with 4-course menu including Butter Poached Lobster with Risotto, Apple, Shiso and Kaffir Lime Broth and Chocolate Tartufo. Get after dinner pampering in "Scent Tents", where you can sample aromatherapy oils and create a customized body scrub, and take some complementary samples home. Finish the night off with Champagne and other sparkling wines in the "Bubbles" Cabana. Menu features Oysters and Pearls topped with Black Pepper Crème Fraiche and Oscetra Caviar, Seared Foie Gras served on Amaretto French Toast and drizzled with Balsamic Maple Syrup and for the sweet finish: Chocolate Profiteroles and Vanilla Bean Ice Cream topped with a Warm Cherry Sauce. Chocoholics, this one is calling your name: after a dinner of Chitarra Pasta made with Lobster, Roasted Tomato and Asparagus and Spicy Roasted Chicken paired with Potato and Escarole, feast on Oliverio's premium all-chocolate buffet - "Choco-Sutra" that features everything from White Chocolate Martinis to cinnamon and red chili-infused South of the Border Pot de Crèmes. Not into the full length dinner + dessert buffet? Grab drinks and small bites at the Poolside Bar . 5-course dinner for $80!!! Start with Organic egg and caviar with crème fraiche or Organic egg with house smoked salmon and capers, or Dark chocolate truffles with creme fraiche, caviar and sea salt. Move to Hot Atlantic oysters with champagne sauce, or Hawaiian hearts of palm and artichokes salad with truffle oil. Follow with Sautéed foie gras with polenta crème brulee, black currant verjus sauce or Scallop Carpaccio with black truffle and porcinis. Mains on offer: Bretagne Dover sole, vermouth sauce and pea sprouts or White Pekin duck with cabernet sauce and braised red cabbage. 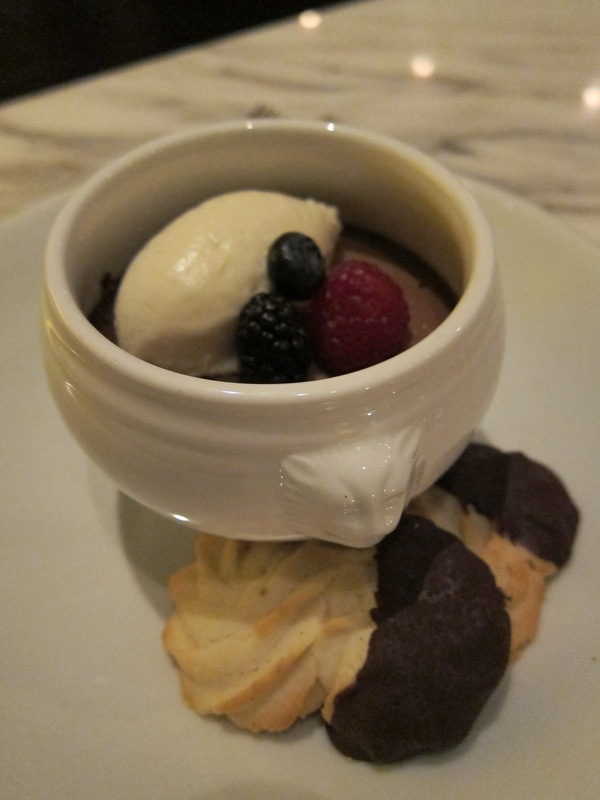 Finish with your dessert selection from assorted sweets /toasted marshmallow with chocolate sauce/chocolate divine cake /crème brulee with orange blossoms/rum baba - to the specialty Chocolate Truffle, made with Crème Fraiche and served with American Sturgeon Sevruga Caviar! And on top of all that - get homemade chocolate truffles to take home. Disclaimer: I have not personally attended any of these events, nor all of the restaurants, and am not affiliated in any way with the parties mentioned in this post. Please see details of events / deals at the respective websites.